Winery/Producer: Guy Breton; Villié-Morgon, France. Pared With: 1st Tasting: Roast pork, garlic mashed potatoes, broccoli and cauliflower mix. 2nd Tasting: Ham quiche with broccoli and cheddar cheese; Caesar salad, and garlic bread. He said: 1st Tasting: Purple color and a tad cloudy. Very nice fruit and strong earthy bouquet. Fruit taste and a medium length finish. Tannins are a little to dominant for me. This wine was good with the roast pork and garlic mashed potatoes, but didn’t have the intensity or complexity of flavors I expected. We’ll hold our recommendation till we have the second bottle. 2nd Tasting:I’m changing my opinion on this wine…tonight we opened both this and a bottle of George Duboeuf dom Jean-Ernest Descombes Morgon 2009 (an old favorite). 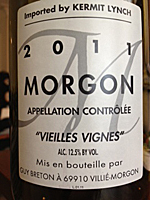 Without question the Guy Breton Morgon Vieilles Vignessimply was OUTSTANDING with the quiche. 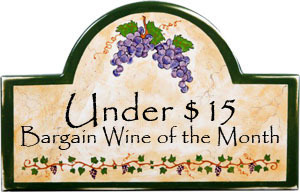 Rich fruit and earth aromas, delicious fruit flavors and a smooth complex long finish. In the end I would say it is a good $30 value. She said: 1st Tasting: I just can’t get enthusiastic about this wine. I loved it enough to buy it at a tasting but it did not do well with our dinner. The wine has a very pleasant bouquet and fruity flavor but zeroed out before ending with a moderately tannic bland finish. The wine improved when the dinner was finished but I can’t recommended it. We’ll see how the second bottle does with other foods or alone. 2nd Tasting: I can’t honestly rave about the bouquet but the wine was a success over all. 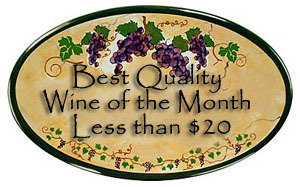 It has a very pleasant flavor with a medium body but stood out for the firm tannins that I adore. The finish is long and the tannins stand out. Yum!!! The flavors are subtle, but it did not knock me out. Ray is better at subtle flavors than I am. I liked it, but at $31 not enough to recommend it over some others we have had. Comments: This is a wine we differ on…and although Vicky doesn’t recommend it, we both think it’s an outstanding wine. In addition, the complex taste and soft texture was head and shoulders better than the George Duboeuf.